The sun is setting just a little earlier each day, pumpkin-spiced everything is appearing in the stores, and fall clothing has begun to dominate magazine covers. As summer slowly transforms to autumn, it’s time to think about infusing healthy eating with late season and early fall foods...and how to do that when the weather grows harsh. Grilled Peach Basil Salad: Peach season starts in May and lasts through September. Incorporate these juicy, flavorful fruits into a fresh salad with burrata (mozzarella) and rocket (arugula). Grilled Vegetable Risotto: Make this tasty dish with any vegetables you find in season. Drizzle your choices with olive oil and some salt and pepper and grill for about 15 - 20 minutes. Carrot Fries with Chipotle Lime Aioli: Present persnickety eaters with grilled carrot fries for a fun twist on these sweet veggies. It’s a perfect finger food to dip and enjoy. Grilled Graffiti Eggplant with Roasted Tomatoes, Chickpeas and Ginger: Ginger adds a little zing to the tomato topping that pairs well with the smoky, tender eggplant. Prep time is a quick five minutes and it cooks in 30 minutes. 1. Charcoal: These grills use charcoal briquettes or lump charcoal, take about 20 minutes to reach prime cooking temperatures and require significant cleanup. Their price tags range from around $30 to $500 and come in different styles: brazier, kettle, barrel, cart, kamado and portable. 2. Gas: Fueled by natural gas or liquid propane, a gas grill's hallmark is very much its cook-and-go-style with easily adjustable cooking mechanisms similar to those of a stove top. And cleanup is also easy. Fancier grills include side burners and rotisserie spits and can run between $90 and $1,000+. (The price jumps as the grills get fancier with bells and whistles such as four or six burners). 3. Electric: The countertop George Foreman grill has grown up before our very eyes! These kinds are of grills are perfect for people who live in apartments (like those of us in NYC with little to no outdoor space...or any space at all for that matter). The price can range from $50 to $600, depending on size and accessories. 4. Pellet: These grills double as a smoker. An auger pushes pellets from the hopper into the burn pot where they burn and smoke your food. They come in barrel and cart-styles and cost between $350 and $1,300. 5. Infrared: Natural gas, propane, or electricity powers these cart-style grills, which use an element to heat a solid surface—like ceramic—to cook your food fast. This most-expensive version costs anywhere from $800 to $1,500, if not more. 1. Grilling aficionados swear by using wood to lend great flavors and aromas to your meals. Common recommendations include whole hardwood logs for use in a wood-burning grill, hardwood chunks in a regular grill, or wood chips mixed with charcoal for your charcoal grill. 2. Follow this grill prep and cleanup mantra: prior to grilling, heat the grate and scrub it with a wire brush. Then rub it with a paper towel dipped in oil. Scrub the grate again after you finish grilling. 3. 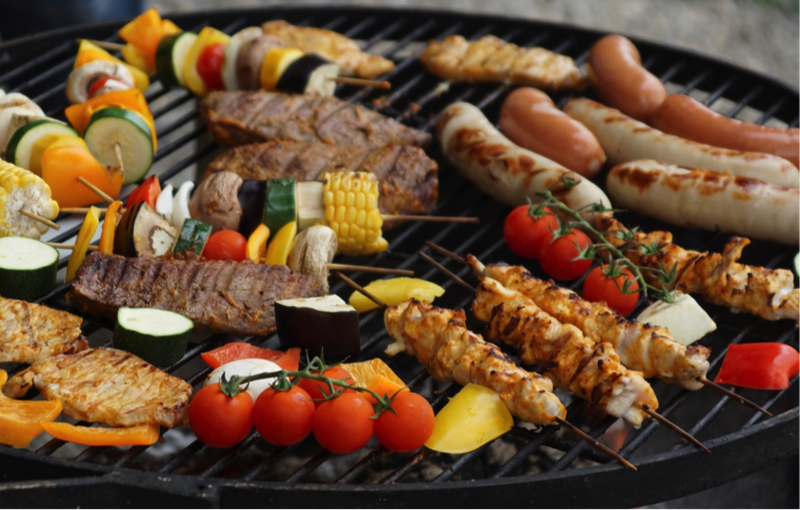 Line up foods neatly to make flipping and removal of food from the grill easier. Plus, in doing so, you’ll use space more efficiently. If you like grill marks and want to gauge cooking time more accurately, don’t flip constantly. Instead, cook for a few minutes and flip just once. Only use tongs to flip meat so the juices don’t “escape” holes caused by a fork or knife. 4. Grilling steak or other meats? Season them prior to cooking. Coarse salt and freshly ground pepper form a savory crust on grilling meats. If you're grilling veggies, a grill’s dry heat also intensifies vegetables’ flavor. So use indirect heat for dense, starchy vegetables like potatoes or eggplant and direct heat for more tender veggies like peppers and onions. 5. We absolutely believe you should allow your meat to rest for a few minutes after it’s removed from the grill. Resting enables the meat's delicious juices to redistribute and reabsorb, which yields a tender, tasty cut. We find if you cut into the meat before allowing it to rest, those delectable juices flow freely out of your meat and that's a very, very sad thing. Some experts say the rest isn’t needed, but you can decide for yourself. 6. The occasional grilled hot dog and hamburger are fantastic. Delicious. Love! But since grilling infuses a completely different flavor into foods, why not take advantage and introduce your kids to other healthy and tasty meals?